If imitation is the sincerest form of flattery, the entire crustacean world should be pretty chuffed right about now. 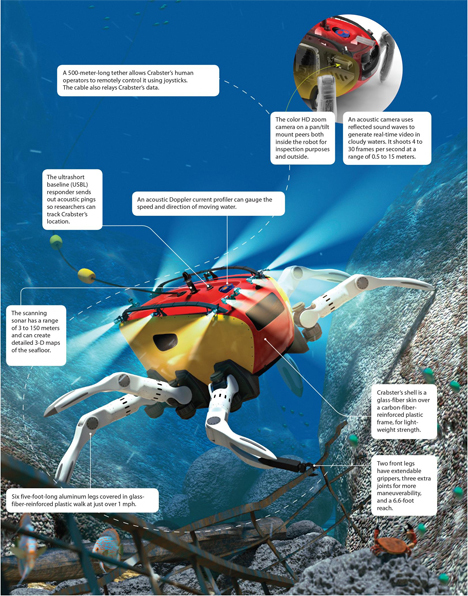 The Crabster CR200, this 1,400 pound beast of a robot, is set to head to the ocean floor for adventures that include research and treasure hunting. In places too dangerous for human scuba divers, the Crabster uses its six legs and massive body to plunge through the currents. 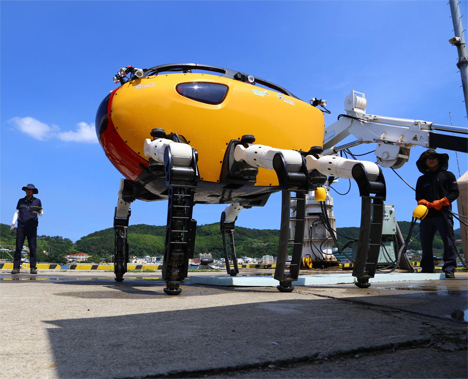 It was developed by engineers at the Korea Institute of Ocean Science and Technology. The Crabster is equipped with an impressive 11 cameras – one of which is acoustic so it can “see” through murky or muddy waters. A scanning sonar with a range of three to 150 meters can send information to the surface about the terrain Crabster is encountering on the sea floor. It can walk along at about a mile an hour, and its two front legs feature extendable grippers for grabbing things. The video above is an update on the Crabster team‘s progress with the project. Until now, we’ve had animations and renderings to suggest what it would eventually look like, but this first look at the ‘bot actually moving is impressive. Don’t worry about the Crabster getting away and coming after you, though. It has a 500-meter-long tether that lets its human operators control it. The Crabster in the video isn’t quite complete; it isn’t yet outfitted with the glass fiber skin that will protect it as it dives to depths of up to 656 feet. Without the skin it looks a little too much like an enormous deadly spider to us. Even if we’d be able to outrun it, it would still haunt our dreams forever.